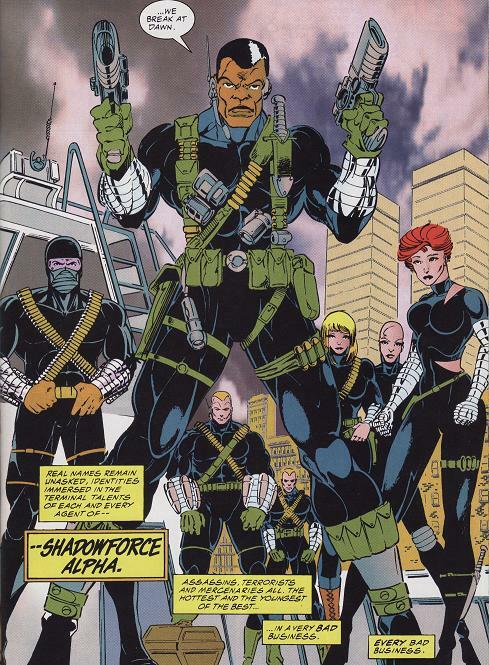 History: (Amazing Spider-Man Super Special#1) - Based on a nameless yacht, Shadowforce Alpha is a daring, highly-trained mercenary terrorist cell that is composed of only the best and brightest covert operatives. Hired to kill Colonel Rudev Broga in his New York hospital room, Bombadier detonated a bomb in the hospital's waiting room as a distraction while Cordite and Clash infiltrated the building. Aided by "the Suit", a turncoat government agent, they succeeded in drugging Broga and taking out his bodyguards, although the suit was killed in the process. The final bodyguard, Cary Armstrong, managed to wound Cordite, but was grievously injured after the arrival of Flare and Stampede. The arrival of the Scarlet Spider (who had battled and captured Bombadier) forced them to flee, but they subsequently signaled Shell and Shot to destroy the room. (Spider-Man Super Special#1) - Shell And Shot found that the Scarlet Spider and Broga had survived. Shot was taken down by the Spider, although Shell managed to escape with Broga. He took him to Operating Theater 8, where Clash had forced Greg Chasen, Raymond Crow, and Ellen Grantz to operate on the wounded Cordite. When the police shut down the power, the Spider took out Shell, Stampede, and Flare, but was captured by Clash and the recovering Cordite. The arrival of a revived Cary Armstrong (now the superhuman Strongarm) turned the tide, allowing the Spider to rescue Broga and the captive doctors. Cornered, Clash and Cordite whipped out grenades, but were prevented from going out in a blaze of glory when Strongarm neutralized the explosives. Comments: Created by Terry Kavanagh, Mike Lackey, Phil Gosier, Greg Adams, & Tom Christopher. So is there a Shadowforce Beta? These guys are totally Evil G.I. 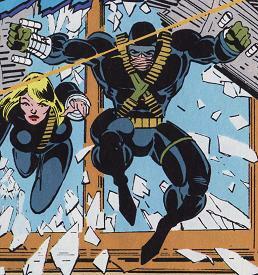 Joe, down to the red-headed female martial artist and the black-clad mute ninja-guy. (Amazing Spider-Man Super Special#1/3) - An explosives expert with a dangerous desire to make things explode, Bombadier set off a bomb in the waiting room of Empire State Hospital. The Scarlet Spider caught her fleeing the scene in a stairwell. She threatened to release the dead man's switch in her hand, prompting the Spider to web her up, keeping the button on the switch depressed. Bombadier wore a padded costume and carried a number of powerful explosives. (Amazing Spider-Man Super Special#1/3 - (fb)) - Clash honed her hand-to-hand combat skills in an "unauthorized army" before becoming Shadowforce Alpha's second-in-command alongside her lover Cordite. (Amazing Spider-Man Super Special#1/3) - Infiltrating Col. Broga's room disguised as a nurse, Clash took out the guards alongside Cordite, although Cordite was wounded by government agent Cary Armstrong. After the Scarlet Spider arrived, Clash fled with the injured Cordite. 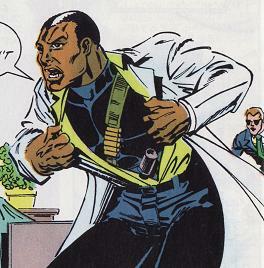 (Spider-Man Super Special#1/3) - Clash took Cordite to an operating theater, where she forced young doctors Greg Chasen and Raymond Crow and student nurse Ellen Grantz to operate on him at gunpoint. When they slipped up, she moved to gun them down, but before she could do so, the power went off and the Scarlet Spider knocked her gun away. When he was distracted by Shell, Flare, and Stampede, she grabbed the gun and took on the Spider. Using one of the doctors as a human shield against the Spider's stingers, she and a revived Cordite held him at gunpoint until the now-superhuman Armstrong burst in and took her out. Her escape route blocked by webbing, she and Cordite whipped out grenades, planning to go out in a blaze of glory, but Armstrong intercepted and neutralized them. Clash is a highly-skilled hand-to-hand combatant, and also wields conventional firearms and grenades. Given her red hair, occasional accent, and membership in an "unauthorized army" (i.e., the IRA), I'm gonna guess that Clash is Irish. (Amazing Spider-Man Super Special#1/3) - Infiltrating Col. Broga's room disguised as doctor, Cordite took out the guards alongside Clash. He, Flare, and Stampede managed to finish off the last guard, Cary Armstrong, although Cordite was wounded in the process. After the Scarlet Spider arrived, the injured Cordite fled with Clash, but not before ordering Shell and Shot to take out the room. 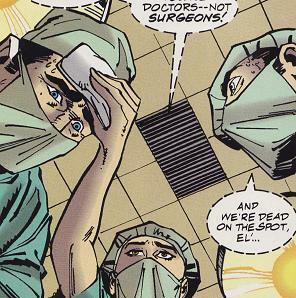 (Spider-Man Super Special#1/3) - Clash took Cordite to an operating theater, where she forced young doctors Greg Chasen and Raymond Crow and student nurse Ellen Grantz to operate on him at gunpoint. They slipped up, injuring him further, but he managed to revive in time for the now-superhuman Armstrong to burst in, knocking his gun from his hand. Cornered, Cordite and Clash whipped out grenades, planning to go out in a blaze of glory, but Armstrong intercepted and neutralized them. Cordite is a skilled leader, and also carried a large number of conventional forearms and grenades. Cordite is an explosive common during World War I, but rarely used now. 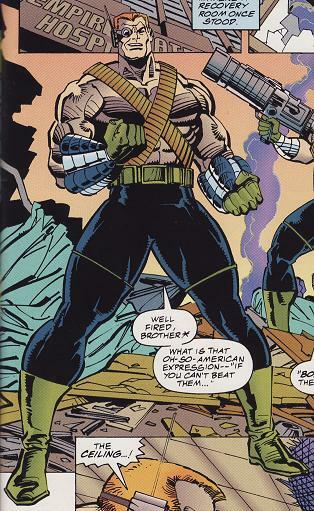 (Amazing Spider-Man Super Special#1/3/Spider-Man Super Special#1/3 - (fb) ) - A super-patriot rendered mute by his own incendiary weapons, Flare worked as Stampede's partner for years before they joined Shadowforce Alpha. (Amazing Spider-Man Super Special#1/3) - After Cordite and Clash took out most of Col. Broga's bodyguards, Flare and Stampede burst into the room to finish them off. Flare set the sole survivor, Cary Armstrong, on fire, and retreated with Stampede when the Scarlet Spider arrived. (Spider-Man Super Special#1/3) - Flare and Stampede watched Cordite and Clash in the operating theater, and were soon joined by Shell and Broga. As the Spider took out Stampede and Shell, Flare grabbed Broga and burst into the operating theater. The Spider followed him, and trapped him with impact webbing. Flare's costume houses a flamethrower on each wrist. (Amazing Spider-Man Super Special#1/3 - (fb)) - An ammo carrier for his twin brother Shot, Shell learned his deadly trade in his war-torn homeland. (Amazing Spider-Man Super Special#1/3) - On Cordite's orders, Shell and Shot blew up Col. Broga's hospital room from across the street. (Spider-Man Super Special#1/3) - Shell and Shot entered the destroyed hospital room, only to find the Scarlet Spider and Broga in a protective web-cocoon on the ceiling. The Spider burst out of the cocoon and dropped Shot with a sedative stinger, leaving Shell to escape with the unconscious Broga. He hightailed it over to the operating theater where his remaining teammates had gathered, only to be knocked out by the Scarlet Spider. Shell is a reasonably-skilled hand-to-hand combatant. He wears a monocular targeting device on one eye. The Scarlet Spider calls Shot a Russian, but he and his brother could probably be from any number of breakaway Soviet republics, real or fictional. (Amazing Spider-Man Super Special#1/3 - (fb)) - Launcher of his twin brother Shell's ammo, Shot learned his deadly trade in his war-torn homeland. (Spider-Man Super Special#1/3) - Shell and Shot entered the destroyed hospital room, only to find the Scarlet Spider and Broga in a protective web-cocoon on the ceiling. The Spider burst out of the cocoon and dropped Shot with a sedative stinger. 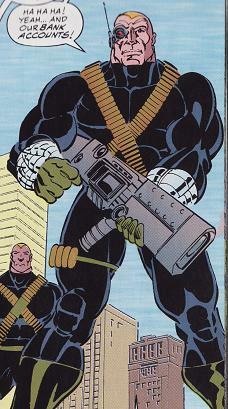 Shot wields a heavy artillery launcher, and utilizes a monocular targeting device. (Amazing Spider-Man Super Special#1/3/Spider-Man Super Special#1/3 - (fb) ) - A mercenary-minded silver-medal runner with a serious need to win, Stampede worked as Flare's partner for years before they joined Shadowforce Alpha. (Amazing Spider-Man Super Special#1/3) - After Cordite and Clash took out most of Col. Broga's bodyguards, Flare and Stampede burst into the room to finish them off. Stampede kicked the sole survivor, Cary Armstrong, towards the window, and retreated with Flare when the Scarlet Spider arrived. (Spider-Man Super Special#1/3) - Flare and Stampede watched Cordite and Clash in the operating theater, where Stampede watched with displeasure as Clash jeopardized the mission with her concern for Cordite. They were soon joined by Shell and Broga, with the Scarlet Spider hot on their heels. Stampede took him on, only to be punched through a window and into the arms of the SWAT team below. 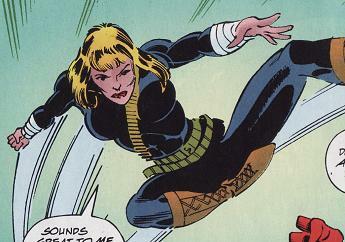 Stampede is an excellent athlete and skilled martial artist (with a preference for flying kicks). (Amazing Spider-Man Super Special#1/3) - A government agent assigned to protect Col. Broga, the Suit was apparently paid off by Shadowforce Alpha. When they attacked Broga's room, the Suit injected Broga with a tranquilizer, and was subsequently gunned down by Cary Armstrong. Cordite refers to the traitor as "the suit". Good enough for me. (Amazing Spider-Man Super Special#1/3) - The ruler of an unstable South American island nation, Broga fell ill and was taken to New York City's Empire State Hospital, where he was cared for by Dr. Noah Purl. Due to US interest in his nation, government bodyguards were assigned to his hospital room. When the terrorist group Shadowforce Alpha, which had been hired to assassinate him, attacked the hospital, a treacherous government agent injected his IV with a tranquilizer. 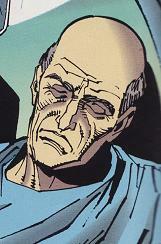 Although the terrorists were driven off by the Scarlet Spider, the Colonel's room was destroyed by Shell and Shot. (Spider-Man Super Special#1/3) - Saved only by a web cocoon, the unconscious Broga was abducted by Shell while Shot battled the Scarlet Spider. He took Broga to an operating theatre where Flare and Stampede waited, only to be recovered and removed from the hospital by the Spider. (Spider-Man Super Special#1/3) - Chasen and Crow, two young doctors, and Grantz, a student nurse, were captured by Clash and forced to operate on the wounded Cordite. Due to their lack of surgical experience, they made a mistake, seemingly killing Cordite. Before Clash could execute them, the lights went out, and the Scarlet Spider burst in. He managed to get Grantz to safety, but accidentally shot one of the doctors with a sedative stinger. The subsequent arrival of Strongarm allowed the Spider to carry the stricken doctor and Colonel Broga to safety. We're never told which doctor is which (and they're wearing surgical masks, so it'd be hard to tell anyway).